Is the end of Motley Crue, well, not really the end for the hair metal band? It appears the guys are back together in some way. 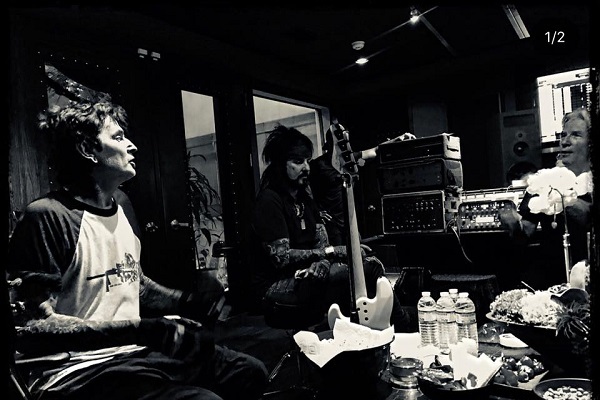 Motley Crue drummer Tommy Lee and bass player Nikki Sixx spent some of yesterday (Aug. 28) in a recording studio with Bob Rock, the producer of “Dr. Feelgood,” evidenced by a photo and video posted on their official social media accounts. Motley Crue’s official Facebook Page has a black and white photo of the guys in the studio together posted with the caption simply stating, “28th August 2018.” Lee posted the same photo on his Instagram account, along with a video of himself rocking the drums in the studio. Guitarist Mick Mars and vocalist Vince Neil don’t appear in the photos. Sixx and Lee haven’t commented further about what is bringing them together in the studio. Fans commenting on the Facebook post are speculating about everything from a new Motley Crue album to perhaps some new music that will be part of “The Dirt” soundtrack, the upcoming Netflix biographical-drama based on the Motley Crue 2001 biography by the same name. The movie is on target to tell the tale of Motley Crue’s fast, colorful rise to fame. One thing is fairy certain: The guys aren’t planning another major tour together. The four members of Motley Crue have stated in the past that they signed a legal agreement not to tour together again following the end of their 2014-2015 farewell tour. That said, the band never said that they would stop making new music together, although tier 2015 single, “All Bad Things,” was billed as their farewell single. Jeff Tremaine, who is known for directing “Jackass,” is directing “The Dirt.” The film is currently in production. No release date for the film has been announced yet.